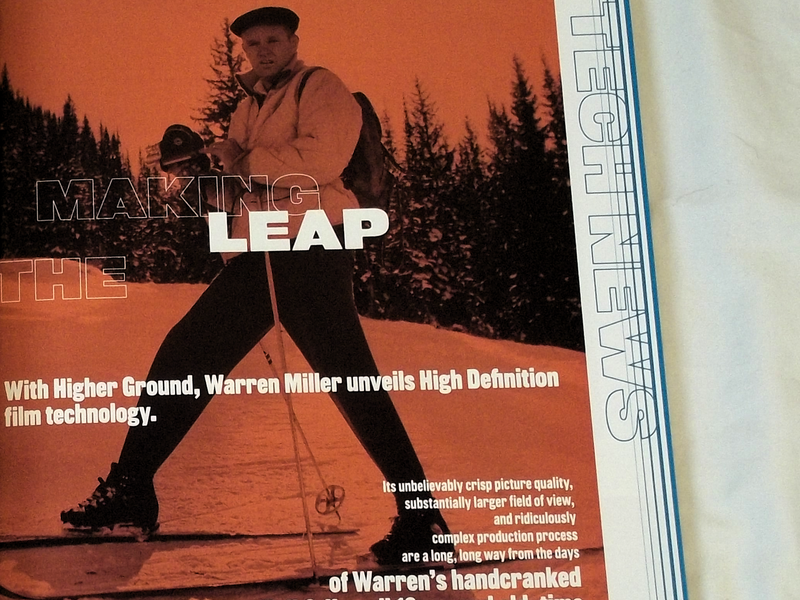 WITH HIGHER GROUND, Warren Miller unveils High Deﬁnition film technology. Its unbelievably crisp picture quality, substantially larger field of view, and ridiculously complex production process are a long, long way from the days of Warren’s handcranked Bell & Howell 16mm and old-time ﬁlmstrip projection. “Kimbo, tell me the truth. You’ve edited the last 18 Warren Miller ﬁlms. What’s special about this one?” I asked ﬁlm editor Kim Schneider. Scrolling to another sequence, not only can I see the roguish expression on Sarah Burke’s face as she overrotates off a huge kicker, but I am blown away by the seemingly endless panorama of remote Canadian peaks around her. All of a sudden Burke’s not just throwing “hospital air,” she’s doing it in the middle of a jagged, foreboding backcountry, visibly distant from any emergency room. Watching in HD is like taking off horse blinders. So, why hasn’t Warren Miller done this before? There are three very good reasons. First, it’s never been done. Not by Lucas. Not by Spielberg. Before now, no one has ever delivered a true nationwide High Deﬁnition ﬁlm tour. Second, it’s extremely expensive: roughly an additional half million dollars. Third, for the last 56 years, the technical side of Warren Miller Entertainment’s moviemaking has been fueled less by avalanches of innovation than by wily imagination. Warren began projecting his 16mm ﬁlms in 1949 sometimes on white bed sheets, using a ﬁlmstrip projector like I remember from junior high science class ﬁlms. Screenings earned Warren as much as $7 (and a ski patrol pin) per show. The accompanying soundtrack was often a homemade recording of a church organist until Warren scored some loaner 78rpm albums. In the ’60s, when Warren was still narrating each screening live, he began recording his voice on the ﬁlm, saving hundreds of travel days, not to mention crates of throat lozenges. Other signiﬁcant changes followed—in 1993 the ﬁlm was “ofﬂine” edited (on tape, rather than cutting and splicing ﬁlm), and in 2000 the ﬁlm was released on DVD and digitally projected. But none of these advances called for the gut-wrenching leap of faith of moving to HD. IN JULY 2004 Higher Ground’s production team, all wearing ﬂip-ﬂops and aloha shirts, was gathered around WME’s conference table for a high-octane meeting. The meeting had been called because WME had discovered a system that would allow conversion to HD while still using ﬁlm. (The team had already agreed on one thing: The movie must continue to be ﬁlmed. Despite the high-resolution of modern video cameras, they weren’t nearly fast enough to achieve WME’s signature slo-mo shots of, say, ﬂoating puffs of powder and bone-crunching wrecks, which for 56 years have made audiences drool and howl.) With HD the picture size and quality would be immensely improved, from initial ﬁlming all the way through ﬁnal projection. But it would cost hundreds of thousands, if not millions, of dollars. Everyone around the conference table knew all too well the knife-edge they hike every year to get the best footage possible. Athletes put their lives on the line for some of the sequences. Camera crews juggle weather, conﬂicting schedules, timing, and budgets in the lyric struggle to capture ﬂeeting moments forever on ﬁlm. No one disputed that they wanted the best footage possible, but the investment would require high-stakes gambling on nonexistent technology. It starts with upgraded ﬁlm and cameras plus all-new lenses. Everything must be purchased and tested before crews ﬁlm a single frame. Luckily, ﬁlm-manufacturing companies like Kodak have been racing to keep pace with video technology, so new “Super 16mm” ﬁlm will deliver the quality needed. The ﬁlm will be processed in “clean rooms” that look better suited to containing viral outbreaks than propagating gorgeous ski cinematography. The ﬁlm is then transferred to HD tape. Sounds simple, but this process, dubbed “HD telecine,” had been the missing link that kept WME out of HD for years. Now, a company in Vancouver, B.C., would provide the two-million-dollar gizmo that takes in ﬁlm and spits out HD cassette tapes—tapes of such high quality that they preserve the texture of the original ﬁlm’s grain, down to a microscopic level. The footage (65 hours of it) will ﬁll about 180 tapes, which will then be dubbed to massive computer hard drives for editing. WME must weed through all that footage to ﬁnd the 90 minutes that will make the ﬁnal cut. For comparison, storing camcorder footage for your ﬁve-minute (non-HD) home movie might use one gigabyte on your home computer. Higher Ground, if transferred in its entirety, would ﬁll 25,000 gigabytes (weighing about 500 pounds). The last step of the ﬁlmmaking process is the “online”—the splicing together from the 180 HD tapes’ raw footage with all the ﬁnished creative effects and edited transitions. The compatibility issues and technical mumbojumbo that will be required to make sure the ﬁnal image doesn’t come out looking like salt and pepper are mind-numbing. All of this would be for naught if the ﬁlm were to tour with existing (non-HD) projection equipment. Selling the ﬁlm to megaplexes isn’t an option—very few have made the hugely expensive conversion to HD—so, to properly present these beautiful HD images, WME will need all-new HD projectors and screens and a nonexistent system for playing back the digitized images to the projector. This isn’t as simple as playing a DVD; the 90-minute HD feature ﬁlm would take up over a hundred DVDs. IF THIS all sounds a little overwhelming, then you’ll understand why the conference room lights burned late into the evening that July night. Ultimately, with admirably informed recklessness, the group decided to move forward with the plan. Thirteen months later, Higher Ground is in its ﬁnal days of post-production in true, 100 percent HD. All the segments have been onlined in High Deﬁnition resolution in Boulder and are off to L.A. for ﬁnal audio synch and color correction. The remaining steps of the ﬁlm’s production happen in dark cellars full of looming stacks of alien-looking computer hardware. WME has committed across the board to producing and presenting the ﬁlm in pure HD. They’ve tested every step of the process, from the Arri SR3HS cameras that captured the action to the Panasonic D7700U projectors that will share it with fans from Orange County’s Performing Arts Center to the Bushnell in Hartford. There’s bustling excitement throughout the Warren Miller ofﬁces—that dangerous “jinx!” moment when it seems like they’ve addressed every concern and now it’s time to knuckle down and get the tour off the ground within eight weeks. The new gear has opened new ways to capture what they see out there in the ﬁeld. The production team has seen all of the ﬁnished material and is already planning new approaches to future segments. And editor Kim Schneider can hardly contain himself. “Check it out—I think I’ve found two identical snowﬂakes!” he jokes. As you watch Higher Ground, you may well ﬁnd yourself looking that close and simultaneously leaning back to take in the panoramic views. Veteran Warren Miller director of photography Don Brolin was known to say that capturing skiing on snow was like ﬁlming two white mice swimming in a bowl of milk. This year, with HD technology, D.B. might concede that now he can tell which of the mice has dandruff.